While I know salad is not at the top of the list for fall comfort foods, but it does serve as a compliment to the plethora of rich and delicious meals that are prepared this season. This simple yet delicious spinach salad still highlights seasonal flavors while still remaining light. 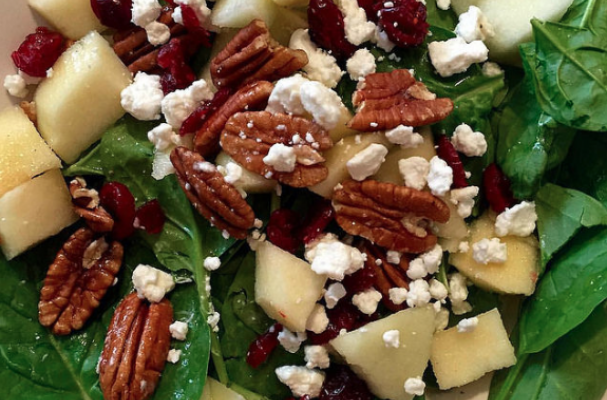 A bed of hearty greens is loaded with crisp apples, buttery pecans, tart cranberries and salty cheese. Each bite is packed with each distinctive taste. Serve with leftover rotisserie chicken or cedar plank salmon. Step 1: Wash and prepare all fruits and vegetables. Heat pecans over in a small skillet over low heat. Toast for 3 to 4 minutes or until just becoming fragrant. Remove from heat and roughly chop. Step 2: In a small bowl, combine vinegar, olive oil, salt and pepper. Whisk thoroughly until all ingredients have combined. Taste and adjust seasoning as necessary. Step 3: Add the spinach to a large bowl. Top with apple, cranberries, pecan, quinoa and goat cheese. If serving right away, toss with vinaigrette or serve it on the side.